From Sweden the participants of the "Ga och cycla till Skolan" Action joined us this year again! During September and October they could chose two weeks where they collected their "Gröna, Gula e Röda Prickar". 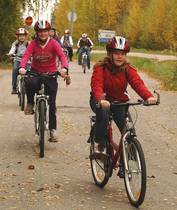 230 Schools have entered the challenge and 34 978 pupils have cycled, walked or used public Transportation.